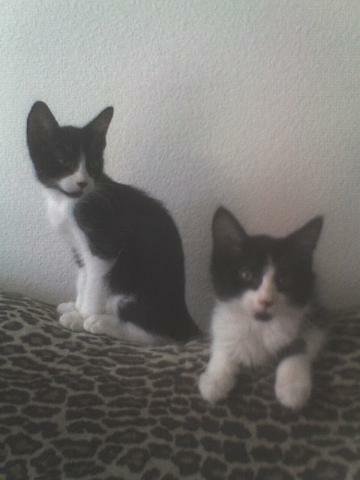 I am the recent, and proud father of two rediculous kittens. They've already put more holes in me than there are in the Jon Benet Ramsey case. Naming them has been a challenge, as i also am the proud husband to an equally rediculous , yet groundingly realistic woman. She wouldn't go for my original plan, of dynamically naming one "Kitty," and the other one, "The Other One." Since i'm destined to always address them both as "Kitty," what better naming scheme is there? Think about it - no matter which one you identified first, it would be "Kitty" and and sitting right next to it would be "The Other One." Makes sense to me. Maybe I'll have better luck with that idea when we start stocking up on children. We've calling them by my wife's suggestion, themed around the original Iron Chef Japanese; Chairman Kaga for the ninja, and Kenichi-san for the fat one. It's not truly fat, but its head is perceptively bigger. Like the pop-singer, Pink; she's physically fit like Bruce Lee, but her swollen head gives her the aura of a pie-eating champion. When you can have dogs. And now I understand the cognitive dissonance I feel whenever I see Pink.